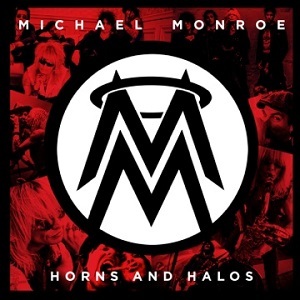 Vocalist, multi-instrumentalist, uber-energetic front-man & all-round rock ‘n’ roll legend, Michael Monroe, has revealed the album artwork for new studio outing, ‘Horns And Halos’, confirmed for UK release on August 26th via Spinefarm Records. ‘Horns And Halos’ – mixed by Petri Majuri at Seawolf Studios, Finland – is the follow-up to 2011’s critically-acclaimed ‘Sensory Overdrive’, winner of Classic Rock Magazine’s ‘Album Of The Year’ and a No. 1 record in MM’s Finnish homeland. Monroe’s touring & recording outfit – bassist Sami Yaffa (ex-Hanoi Rocks/New York Dolls), guitarist Steve Conte (ex-New York Dolls/Company Of Wolves), drummer Karl ‘Rockfist’ Rosqvist (ex-Chelsea Smiles/Danzig) and Dregen – have been hard at work in the studio, providing creative support for a frontman whose reputation is genuinely global and whose influence continues to be felt, with musicians of all ages (from Dave Grohl to the original Gun n’ Roses’ members) citing Michael’s ground-breaking career as a source of inspiration. A second single / video from ‘Horns And Halos’ will be made available on August 5th 2013 via Spinefarm Records, details tbc.